Thanks to Tristan at wheelworks (http://wheelworks.co.nz/blog/home/) who put me in touch with Andrew Young having told him that I was desperate for a job (maxed credit card, having taken all £1650 of my overdraft from Natwest already) I am now working part time at Wellington's newest bike shop, iRide. Tristan has been a great help to me, starting off by rebuilding my front wheel after I landed pretty badly on it after sliding off line on a Mt. Vic. traverse and off a 5ft drop to flat. Certainly wasn't my proudest moment, however I'm very impressed by my DT Swiss Carbon forks; there was a horrible cracking sound and I was very worried that I would have destroyed them, but 2months later and they are still going strong. He has since helped me out a number of times for which I am very grateful. He's also a really nice guy to boot! If you're ever in NZ and need a wheel built (or even not in NZ), he is your man! He also writes the spanering sections in MTB and Road NZ with the kick-start things; his little tips will help most mechanics, be they home mechanics or long time professionals. 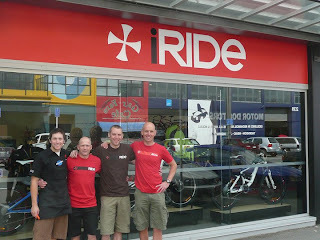 So, having been put in touch with Andrew we met for a coffee (which seems to be the way the world works here; having also met Zeph Wadsworth, the Wellington Yeti rep and previous mechanic for the lunachix world cup team over a coffee), had a chat and I soon found myself helping build bikes in preparation for the opening of the iRide shop. I was working under the guidance of the shops mechanic, Stuart (stewie) Thomson who can be seen on the far left of the founding fathers above (Andrew is on the right, Mike is middle Left, Dave middle right). Since then the shop has opened up, and served quite a few customers. The shop is a Specialized concept store including massage, workshop, cafe (with the amazing Havana coffee, made by the effervescent Dan and Aiden) and (coming soon) BG fit area. It's well worth a visit, even just to try some of the cake! I could go on about the shop for ages, but I won't, just drop in and visit for a chat. Right, I will stop here and do a seperate blog for the last race.